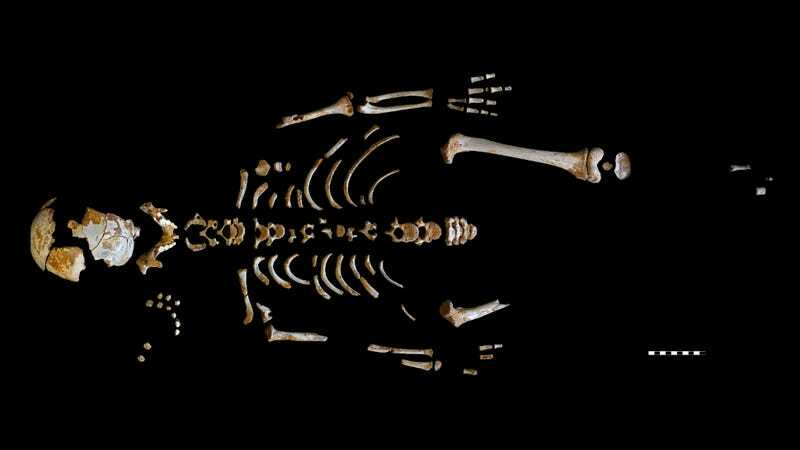 He was just seven-and-a-half when he died some 49,000 years ago, an otherwise healthy Neanderthal boy whose cause of death remains a mystery. An analysis of his well-preserved skeleton is providing new insights into how these extinct humans developed and matured, revealing an extended period of growth in certain aspects compared to modern humans. Like modern humans (Homo sapiens), Neanderthals (Homo neanderthalensis) took a long time to mature into adults, but owing to their distinguishing physical characteristics—such as a larger braincase and wider body—they exhibited some unusual growth patterns, according to an analysis of a skeleton found at El Sidrón cave in northwestern Spain published today in Science. Specifically, the skeleton suggests that Neanderthal brains and spinal columns took a bit longer to grow compared to modern humans. Yet overall, the new study shows that Neanderthals and modern human growth patterns share striking similarity—a finding that improves our understanding of human evolution and biology. Around 2,500 Neanderthal fossils have been excavated in the El Sidrón cave system since its accidental discovery in 1994. Recently, archaeologists uncovered a single family group of Neanderthals consisting of seven adults and six children (including an infant). The first of these skeletons to be studied belonged to a Neanderthal juvenile, allowing a research team led by Antonio Rosas of Madrid’s National Museum for Natural Sciences to perform a comparative analysis of Neanderthal and modern human development. The first step was to determine the chronological age of death by performing a dental analysis. The specimen, dubbed El Sidrón J1, exhibited a mix of baby and adult teeth. Incremental markings on the teeth, which are counted like rings on a tree, showed that the boy died at 7.7 years of age. The skeletal remains exhibited no signs of trauma, no signs of sickness, or any other physical abnormalities. El Sidrón J1, aside from experiencing an untimely death, appears to have been a perfectly normal and healthy Neanderthal child. The researchers then compared the skeleton’s biological stage of development with what would be expected in a modern human of the same age. To their surprise, they found few differences between the two human subspecies in terms of the pace of growth. “The comparison...indicate(s) that there was no noticeable difference in the growth and maturation of this Neanderthal juvenile in comparison with modern human juveniles,” said study co-author Luis Rios, a Member of the Paleoanthropology Group at Museo Nacional de Ciencias Naturales, at a press conference held yesterday. Perhaps more significantly, analysis of the Neanderthal skull shows that El Sidrón J1's brain was roughly 87.5 percent the size of an average adult Neanderthal at the time of death. The brains of modern humans, on the other hand, reach 95 percent the size of an adult at that age. Previous studies have suggested that the larger brains of Neanderthals underwent rapid growth during these formative years, yet this new research would seem to contradict such claims. Importantly, the larger Neanderthal brain doesn’t mean they were smarter than modern humans, nor does the slower growth rate indicated by the new skeleton mean that Neanderthal children were less cognitively developed than modern humans of the same age. It simply means that Neanderthal brains grew differently. But in all fairness, it’s difficult to know much for sure. This latest study tells us something about the growth patterns of Neanderthals, but it doesn’t speak to cognitive or behavioral development. Determining that is tricky business, involving genetics and keying in to clues of Neanderthal behavior. In this case, the boy’s fingers and wrists exhibited some wear-and-tear indicative of tool making. The researchers speculate that this seven-year-old was already engaging in adult-like activities. Taken together, this evidence suggests that the extended development of brain and spinal growth was a result of Neanderthals’ unique body form and physiology, and not differing growth rates. In fact, the evidence points to Neanderthals and Homo sapiens sharing a slow rate of growth, a trait we likely inherited from a common ancestor such as Homo antecessor. Schwartz, who wasn’t involved in the study, said it was remarkable that some aspects of Neanderthal growth were quite modern-human-like, while others were not. “It also highlights how ‘modular’ growth is, with certain ‘packets’ (dental development, torso development)...capable of undergoing accelerations or decelerations, as natural selection fine-tunes and modulates how body systems are synced to things like overall brain growth,” he said. During the press conference, Luis Rios admitted that this was a shortcoming of the paper. “It is difficult to get samples,” he said. But he pointed out that his team is still trying to get the “whole picture” of Neanderthal growth, and that this was the first of several analyses to be done on the recently recovered El Sidrón skeletons. This story is far from over.